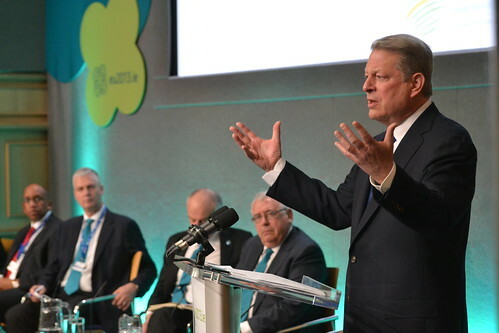 Former US Vice President Al Gore speaking at the Hunger, Nutrition, Climate Justice Conference in Dublin, 16 Apr 2013. CGIAR CEO Frank Rijsberman (second from left) looks on. Read more about this event. Photo credit: Vanessa Meadu/CCAFS. 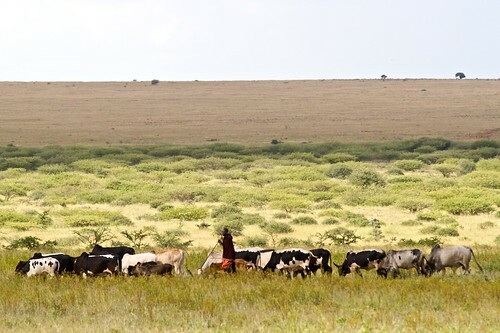 ‘William Ole Seki Laitayock, a pastoralist from the Ngorongoro area of Tanzania, explained that the Maasai culture, which revolves around cattle, is under threat due to competing commercial interests (mining, agriculture, tourism) that drive them off land or prevent them from moving freely. Climate change only aggravates this. Laitayock explained that policies and interests that constrain the mobility and movement of pastoralists undermine their main tactic for staying resilient. Maasai herding his cattle in Tanzania (photo on Flickr by Saadiq Rodgers-King). Jimmy Smith, director of the International Livestock Research Institute (ILRI), headquartered in Nairobi, Kenya, agrees. He attended the Dublin conference and recently presented this overview of the history of our livestock-human relations: Taking the long livestock view, Jan 2013. See also ILRI’s Shirley Tarawali, director of Institutional Planning and Partnerships, on Options for enhancing resilience in pastoral systems, Feb 2012. And see ILRI scientist Polly Ericksen on Mapping hotspots of climate change and food insecurity across the global tropics, Mar 2011. Read the whole article on the CCAFS Blog: Risks, rights, knowledge and empowerment: Connecting the dots, 16 Apr 2013. Read a previous article about this conference on ILRI’s Clippings Blog: Hunger-nutrition-climate: Can the ‘centre’ hold? Is ‘climate-smart’ agriculture the answer?, 16 Apr 2013. For more information, go here. Follow the conference on Twitter by searching for #HNCJ. Watch a short (3.32-minute) animated video from Ireland, a country that should know, on modern links between great hunger and climate change. Tags: HNCJ, Ireland, Jimmy Smith, Polly Ericksen, Shirley Tarawali. Bookmark the permalink. Previous post ← Hunger-nutrition-climate: Can the ‘centre’ hold? Is ‘climate-smart’ agriculture the answer?